The Huawei MateBook X Pro, featured here at the Mobile World Congress 2018, is one of the most impressive laptops I've seen in a long time. The 91 percent screen-to-case ratio is first-rate and gives us a laptop with vanishingly thin bezels that fits the latest flagship phones. The X Pro is also powerful, has a Dolby Atmos four-speaker audio system and is extremely thin and lightweight. And it has a webcam hidden in its keyboard! Because of its extremely thin bezels, this laptop does not have the space above its display to accommodate a traditional camera, so it needed to be hidden somewhere else. 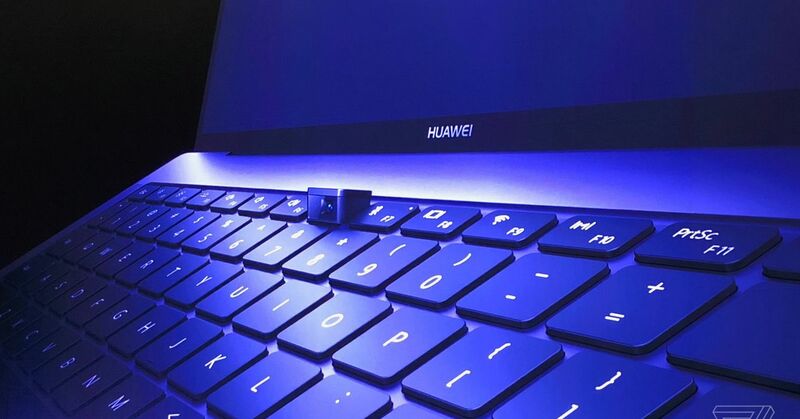 Huawei has opted for the novel approach of disguising the camera as a keyboard key and placing it between the F6 and F7 keys. It opens when you want to use it and closes, guaranteeing your privacy if you do not. Companies like Dell (and Lenovo, for short) have solved the problem of thin upper bezel by inserting the webcam into the lower bezel under the screen instead. This solution has led to the phenomenon of "nasalcam" due to the changed viewing angle from which the camera looks at the user. Instead of being somewhere at eye level, the bottom camera sits next to the keyboard and looks more or less in the nose while you use it. Huawei's pop-up webcam does nothing to fix this problem, but it's definitely the coolest nasalcam that's been developed, and it has the advantage of having a physical privacy cover when not in use. Update February 25, 10:40 AM: After using the webcam for me, I can say that it is incredibly impractical. To actually look it in my face, I have to tilt the whole laptop because of the fixed camera angle. It's a cool idea, but probably would not have turned into a real sales product. People are probably very frustrated when trying to use this webcam.